Men who drink four drinks in any given day, or 14 drinks per week. Women who have seven drinks a week or three drinks in any given day. Seniors (65 or older) who have seven drinks a week or three in any given day. CASI – short for Computerized Alcohol Screening and Intervention – is an interactive test that was developed in 2006 to help patients rate their use of alcohol and learn whether drinking is beginning to affect their health. 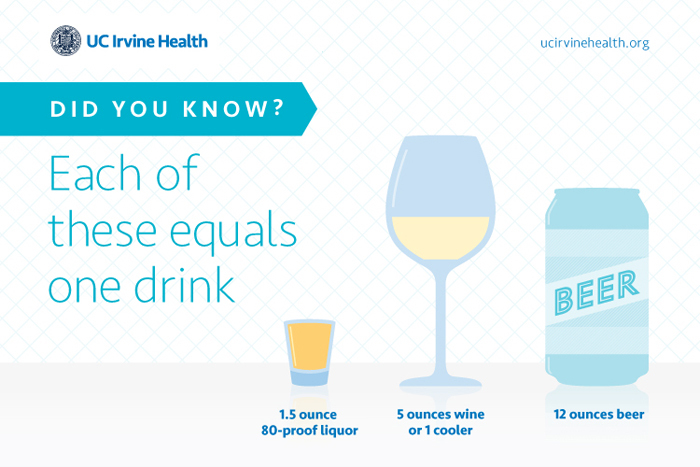 “It’s a great injury prevention program that helps us educate people about drinking and offers a brief intervention and resources to help them control it,” says Dr. Shahram Lotfipour, professor of emergency medicine and public health and director of the Center for Trauma and Injury Prevention Research at UC Irvine School of Medicine. The Trauma Services Program at UCI Health, under the direction of Dr. Michael Lekawa, is trying to break down the trauma-and-alcohol relationship by offering this test and intervention to trauma patients, in an attempt to prevent future heartbreaking emergency room visits. The program has made a commitment to providing these important resources to every trauma patient, Lotfipour says. The UC Irvine-designed test is also being given to patients at Mission Hospital in Mission Viejo, Kern Medical Center in Bakersfield and Stanford Medical Center in Palo Alto. Additionally, it is used at community health fairs, college campus activities and safe-driving events. For more information about responsible drinking, call Orange County Health Care Agency Alcohol and Drug Abuse Services at 714-834-3840.